Walk-ins, Singles, Couples & Absolute Beginners are all welcome $15.00/person. 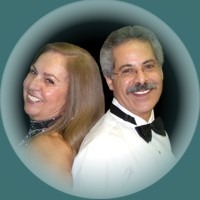 Instructors, Samir & Eleni Elabd, the owners of Ballroom Nights have been partners both in life and in dance since they met in 1972. 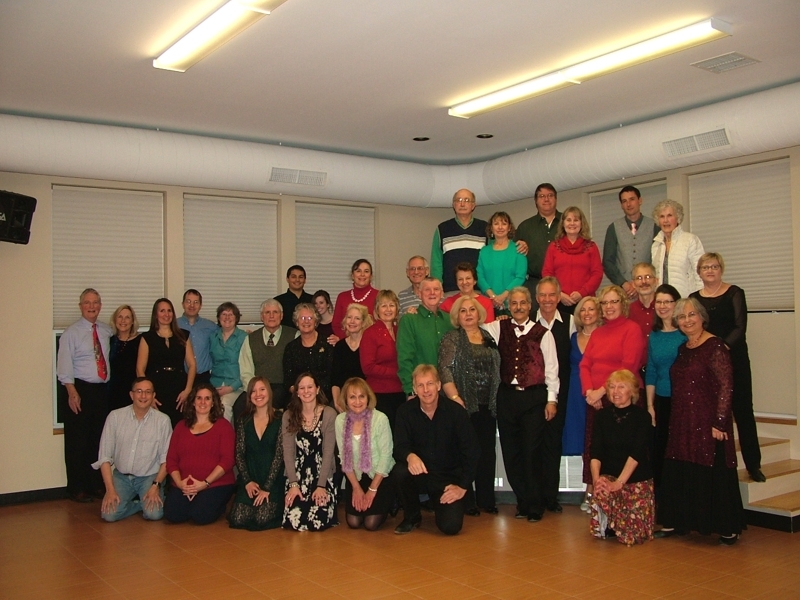 They received their professional ballroom dancing training at the Gene Kelley Dance School in Athens, Greece. It is a delightful activity for couples to share, and a fast, safe way for singles to meet potential friends and partners. Do you want to dance - but can't get started?... We can help! Over the years, we have dedicated ourselves to providing our students with the easiest and quickest way to learn to dance and build confidence on the dance floor. Our teaching method is Progressive and Interrelated. Each pattern builds on the previous one and most patterns can be transferred from one dance to another. You will learn figures quickly and easily. You will also find, that when you learn few basic steps, you will be able to adapt them to different dances. You can improve your dancing in one evening - even if you've never danced before and thought perhaps you couldn't. You will receive e-mails with information about the classes schedule and upcoming dance events. Everyone is welcome, regardless of age, single or not, just come with a desire to have fun! Our classes and open social dances are open to dancers of all levels, from absolute beginners, and those who say they have two left feet to experienced dancers. No partner is required! We are looking forward to having you as part of our dance community. Waltz is characterized by grace and elegance. It is a moving dance (it travels the floor) and is popular at wedding dances or other social gatherings. Technique for Waltz includes the most dramatic rise and fall of all the dances. It is counted as "One, Two, Three" with "One" being the downbeat. Staccato and sharp, Tango is a moving dance whose character is catlike. This dance is most characterized by intense passion. Unlike the other Standard dances, there is no rise and fall in Tango. Footwork includes the picking and placing of the feet. Counted in Slows and Quicks. Is the original Tango, not to be confused with its Ballroom derivatives American and International Tango. It has an intimate, compact hold and features intricate footwork and a sensuous, passionate character. It is also a moving dance, characterized by long, continuous smooth and flowing movements across the dance floor. Foxtrot uses many similar figures to those found in Waltz. Counted in Slows and Quicks. Viennese Waltz can be thought of as the combination of Waltz's grace and elegance with the inclusion of speed. Due to the fast timing of the music, many Waltz steps may not be executed in V. Waltz, and therefore the syllabus includes fewer figures. Viennese Waltz can be most characterized as a swirling traveling dance. Counted "One, Two, Three" with "One" being the downbeat and roughly double time of Waltz. Quickstep is the fusion of Waltz and Foxtrot with a speed more comparable to V. Waltz. This is a regal dance characterized by grandeur and showmanship.The technique includes less rise and fall to compensate for the speed. Quickstep is counted in Slows and Quicks. Rumba is characterized as romantic and sensual (sometimes called "The Dance of Love"). It is a spot dance (danced in one place) and is expressed through body movement. Technique for Rumba uses Cuban motion of the hips. The timing is counted in Slows and Quicks. Cha Cha is fun, flirtatious, and playful. The dance is named after its distinct syncopated triple steps "Cha, Cha, Cha". It is a spot dance and is expressed through body rhythm. Technique used includes Cuban hip motion and syncopated steps. Counted "1, 2, 3, 4 and 1", where the "4 and 1" segment may be replaced respectively with "Cha, Cha, Cha". Is similar to Salsa (very fast!). The basic timing is quick-quick-slow. It is one of the Ballroom Rhythm competition dances, the others being Rumba, Cha-Cha, Bolero, and East Coast Swing. Samba is characterized by its joyfully contagious tribal beat. It is a moving dance (it travels the floor) and uses a pronounced rhythmic bounce action. Samba is counted most commonly as "uh 1, uh, 2 uh, 3 uh, 4"
There are many forms of swing. East Coast Swing, West Coast Swing, Lindy, Lindy Hop, Jitterbug, etc. All of them originate in the 1920's with the Black community dancing Charleston and Lindy Hop to Jazz music. East Coast Swing, sometimes referred to as Jitterbug, is the most common Swing dance. It is one of the American Rhythm dances, and has a bouncy character with a basic timing of rock-step, triple-step, triple-step. Despite its name, East Coast Swing is danced all over the country, and is the Swing many dancers learn first. Single-time Swing, also known as. "City Swing," is directly derived from East Coast Swing. Instead of dancing triple-steps, you take a single step to each side, making the basic timing step, step, rock step. This simpler basic makes City Swing easy to dance to very fast music, such as you are likely to encounter at parties or in clubs! Swing steps are a combination of rock steps and single or triple steps. Bolero is the slowest of the Latin dances and a slow relative of Rumba. It combines controlled movement with dramatic expression of the music. It is a unique dance style combining the patterns of Rumba with the rise and fall character of Waltz and Foxtrot but with no foot rise, just body and leg rise. It has a very smooth, continuous and sweeping feeling. Bolero is danced in 4/4 time at about 21 to 24 mpm (measures per minute). It has a Slow, Quick, Quick rhythm. Even though it is a Latin dance, it is danced with more of a smooth dance frame. As with all Latin dances, toe steps are used. Merengue is danced to really fast Latin music. It consists of very simple steps organized into sets of 8, and features a characteristic hip action and graceful arm flourishes. It's an easy dance to learn and to dance with different partners, making it great for clubs with fast music! Salsa is a latin american dance that emerged in cuba and puerto rico. It consists of a lot of hip movements, fluid transitions and intricate footwork. It is a very energetic Latin dance. Lots of fun, complete with spins, sharp movement, and crisp turns. Very popular in Latin clubs along with merengue. Styles varies depending on where you are from. Disco dancing is a dance style popularized during the 1970's. Disco dancing is usually associated with John Travolta's dance style in the movie "Saturday Night Fever. "Disco dancing is characterized by hip and pelvic moves, along with raised arms, performed in time to the beat of the music. Artists such as Donna Summer, Chic, and the Bee Gees had many hits in the genre, which peaked with the release of the film Saturday Night Fever (1977).